If you don't know Simone Biles' name, you probably haven't turned on a television in the past week. The incredible Olympian has been one of the super stars of the Rio Olympics, and she definitely was Thursday at the women's all-around competition, rocking gold makeup no less. If you were wondering how to get Simone Biles' makeup look from the Women's All-Around competition, I'm going to try to get you there. We can't all be Simone Biles, unfortunately. We can't all fly across a floor or slay some uneven bar. However, we can rock killer golden sparkles and winged line in her honor. I promise no spoilers on the competition, though! Earlier on Thursday, prior to competing in the All-Around, Biles took to her incredibly entertaining Snapchat — did you see what happened with that fire alarm? — to showcase her competition makeup, and the woman doesn't just have gymnastics skills. With a kitten flick of liner, golden glitter along her bottom water liner, and her now signature beaming smile, the gymnastics star shine as much as that glitter pigment she was rocking. If you want to channel your inner, fierce Simone Biles, I'm going to try to help you a little. The look is impactful but fairly simple. 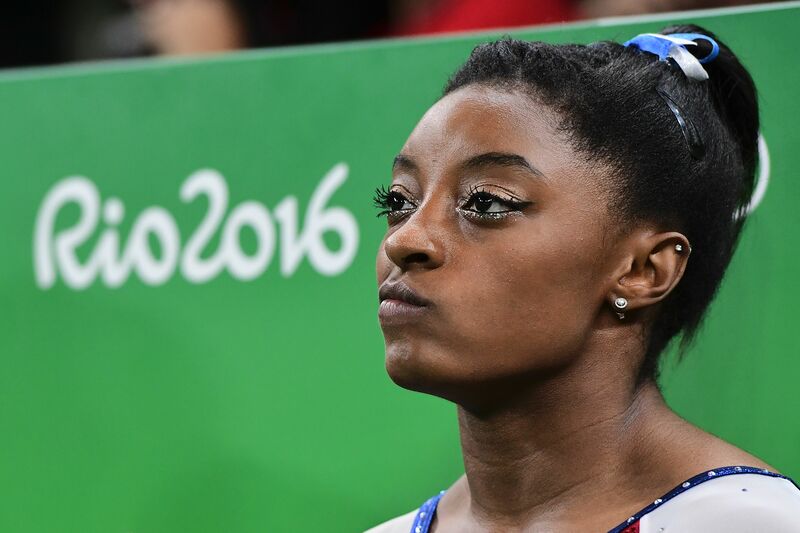 So what will you need to get Simone Biles' Rio 2016 All-Around competition? Waterproof was sure to be necessary. If there's a medal involved, tears would be too. That banging golden under eye is the key to the look. Now if only I could learn how to slay the beam the way that she does.